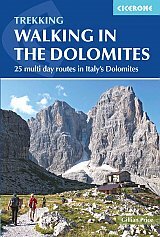 Guidebook to 25 extended walks in the Dolomites mountains in the far northeast of Italy. The walks are mostly circular and 2 to 3 days long, and take in the Marmarole, Marmolada, Civet, Sella and Cortina Dolomites among others. Includes notes on accommodation, wildlife, transport, equipment, a glossary and other practical information.